Sun City Texas homes sales are poised to have another great year. There are lots of Baby Boomers out there just waiting to get on with their new life in a resort-like community such as Sun City Texas. Weather is great, taxes are reasonable, activities out the Wazoo and a friendly engaging population. 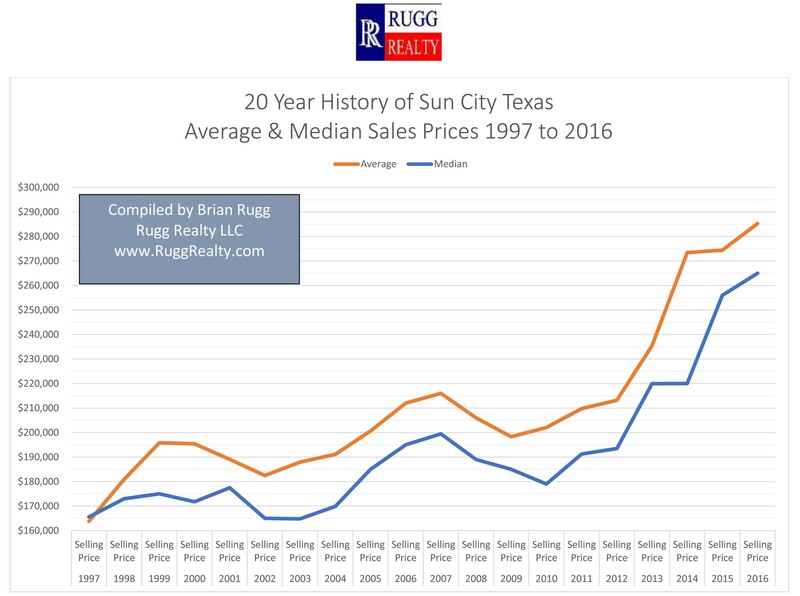 20 year Historical Average Home Sale Price in Sun City Texas. As one can easily see, Sun City Texas has stayed resilient to the downturns other areas of the country experienced in our last 2008 to 2012 recession. We have seen sale price increases every year since the 2012. Over the past five years of 2012 of 2016 Sun City Texas has consistently shown an average of 413 re-sales each calendar year. Sun City Texas will have 445 resales at an Average Sale Price of $296,700 a 4% increase.